The meeting space just across the road from Falvey’s main entrance is called The Grotto, yet a grotto is understood to be a cave or “an artificial recess or structure made to represent a natural cave.” One might ask why this area is called The Grotto when it really is a Shrine to Our Mother of Good Counsel. For the answer, one can look to the University history. Originally there was a true grotto, built between 1906 and 1907. It was a small structure “at the point where the walk from the railroad station entered the campus (near the present Falvey Hall)”(1) and was probably on the road between Falvey and Alumni Hall. The Grotto was an ivy-covered, rounded mound with a door leading inside. On top were two statues of white Carrara marble, St. Nicholas of Tolentine on the left and St. Rita of Cascia on the right, both Augustinian saints. Inside was another statue, probably an image of the Virgin Mary as Our Mother of Good Counsel, to whom Augustinians promote devotion. The three statues for the original Grotto were purchased from the Daprato Statuary Company in Chicago, Ill., for $900. Giovanni Tonsoni was Daprato’s main sculptor, working there from 1879 until 1910 and he is likely the sculptor of the three statues. Tonsoni was a native of Carrara, Italy, the site of famous marble quarries, and he probably received his artistic training there before coming to the United States. (2) Carrara marble has been a favorite stone for sculptors throughout history, especially during the Renaissance. Michelangelo carved his “David” from Carrara marble. 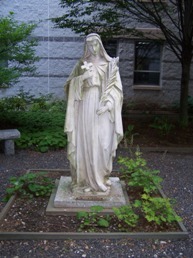 The statue of St.Rita is now in one of the courtyards of the Saint Augustine Center for the Liberal Arts, but the location of the others is not known. The original Grotto was demolished in 1949 during a campus expansion. In 1954 a new structure, the present day Shrine to Our Mother of Good Counsel was built. The seven-foot-tall white Carrara marble statue of Our Mother of Good Counsel also came from the Daprato Statuary Company (now Daprato Rigali). Today this shrine is also called The Grotto and is often used for gatherings during new student orientation. Jim Croce, the musician and a psychology major who graduated in 1965, reportedly wrote “Bad, Bad Leroy Brown” at The Grotto while a student, although the song was not released until 1973. On May 15, 2004, The Grotto was the site of the College of Engineering’s first annual Hooding Ceremony. The present day Shrine to Our Mother of Good Counsel was designed by the Rev. John J. Vrana, OSA (1906-1983). Father Vrana, born in the Bronx, NY, graduated from Villanova College in 1928 with a bachelor’s degree in philosophy. After studying theology at Augustinian College, he returned to Villanova where he taught from 1931 to 1961. He earned a master’s degree from Villanova in 1934 and a master’s degree in Fine Arts from the University of Pennsylvania in 1942. Among his other activities at the University, he served as a liaison among the architects, contractors and University administrators during the construction of twelve campus buildings. Dominic Cannito (1894-1968) of Ardmore, a sixty year old stone mason, was in charge of the construction of the Shrine. Earlier he had worked on Fedigan Hall, Mendel Hall, the Library, Naval Science Building (now John Barry Hall), and the Chemical Engineering Building. 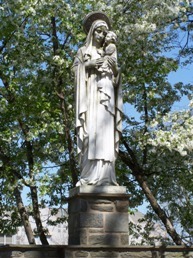 While the University funded the Shrine, the Class of 1954 donated the statue: This is noted on a bronze plaque to the left of Our Mother of Good Counsel. The plaque was unveiled on April 24, 1954. The Very Rev. James A. Donnellon, OSA, University president, accepted the gift. The next day the Very Rev. Joseph Dougherty, OSA, the Augustinian provincial, celebrated a Field Mass after Father Donnellon blessed the statue and the shrine. 1954 was a Marian Year; the erection of the Shrine that year was especially appropriate. As part of the three year Transformation of the Campus Landscape initiative The Grotto will be relocated to an area between Austin Hall and St. Rita Hall. An arched entrance will be added and The Grotto will become a small amphitheater holding no more than thirty people. (2) Personal communication from Victoria at Daprato Rigali, 7/29/2010. Father Dennis Gallagher, OSA, PhD, University Archivist, clarified the role of Our Lady of Good Counsel with the Augustinians and suggested that the statue inside the original Grotto was probably Marian. Brother Jack Stagliano, OSA, suggested literary sources for Our Mother of Good Counsel.